December 2008 I saw a quilting video by Jackie Wills on You Tube. The video was about a hexagon Christmas quilt. 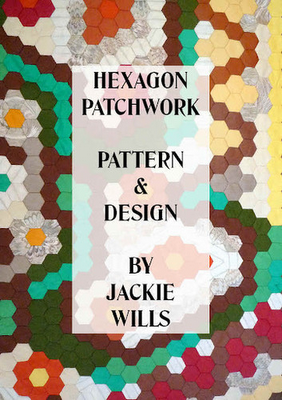 Two months later I bought Using Hexagon in Patchwork by Jackie Wills. This book was self published by the author. I read the book and forgot about it. Fast forward three years later, a friend gave me a bolt of green fabric with small Christmas designs on it. I decided that I will use the fabric as muslin to test the fit of a TNT blouse/top pattern, and suddenly the more I looked at the fabric the more I started thinking about the holidays. I found the book and as I looked at the black and white diagram for the Christmas quilt, I realise that the diagram of the was not clear and that it would have been very difficult to follow. I went to the author's website and sent her an e-mail inquiring if she had a diagram of the quilt that was easier to follow. She responded quickly and sent me a revised version via pdf file. The revised version was in color- awesome. instructions for this quilt. You follow her tutorial on you tube and follow the diagram. I want modern holiday colors not the traditional red and green. I choose the pretty green fabric that was given to me, a orange red and I cut out dark red poinsettias from a two Christmas tablecloths I bought 10-years ago for $2.00 eac). The author of the book sent a sample of different size hexagons; I choose a small hexagon because this is a large quilt. I cut out the hexagons out of scrap paper and 2-inch squares of fabrics in each color. Jackie Wills wrote a second book, taking advantage of computer technology and photos in the book are vibrant and so pretty. I also bought this book. You can also find her on facebook. In other quilting news the quilt below I completed the top 4 years ago and last weekend I found 5 yds of corduroy fabric. I washed it and used it as the backing for this scrap quilt. Scraps quilts tell a story, every bit of fabric in that quilt reminds me of a particular time in my life or my children’s’ life. This is not a award winning quilt, it just a scrap quilt to keep your warm on cold fall/winter days. Both quilts are gorgeous! I know your kids will treasure them both! I haven't tried hexagons yet but they always catch my eye. One day! I also like them both. The first one is real eye-catcher. How big this one is going to be? Thank you Ruta. The finished size is 70-inches wide by 60-inches long or 178cm x 153cm. Very pretty quilts, you are so right they tell such stories. Thank you Lori, quilts do tell a story.